Eager to emerge from the “trance” and “lack of imagination” plaguing electric guitarists for the past several decades, Corrado Rustici devoted six years to exploring sounds and expansive musical contexts utilizing only the guitar as his field of experimentation and expression. The imaginative results are the nine songs he composed that together form “Aham,” an audacious collection of ambient fusion, progressive jazz, ethereal rock, moody pop, and dramatic classical performed and produced by Rustici set for release in the U.S. on July 15. 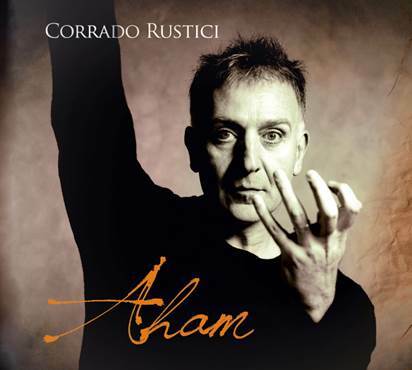 The Naples, Italy native will perform music from “Aham” on home soil in November in support of the album, which Sony Classical is releasing in that territory next month. After leading his own band (Nova) in the mid-to-late 1970s, which included collaborations with Phil Collins and hit-maker Narada Michael Walden, Rustici relocated to California and has been a San Francisco resident since 1978. As an award-winning producer, Rustici helped craft a library of No. 1 Billboard singles in Europe and multi-million selling albums working with global superstars such as Zucherro, Paul Young and Luciano Pavorotti. In 2007, he became the first producer to simultaneously occupy the top 3 spots on the Nielsen chart with three different artists (Ligabue, Negramaro and Renga). Over the years, his passion for sonic innovation has resulted in unearthing now widely accepted and used production methods such as Push & Pull, which combines the irreverent approach of rock and pop with the softer and more evocative effect of ambient music. As a solo artist, his previous releases are “Deconstruction Of A Postmodern Musician" (2007) and “Blaze & Bloom: Live In Japan” (2014), the latter of which was also issued as a DVD.